The second way is to calculate what it would cost, using today’s labor and material prices, to replace the structure with a similar one. If the structure is not new, the assessor determines how much is has depreciated since it was built. The resulting value is added to an estimate of the market value of the land. This method is used to value special purpose and utility properties, and is called the cost approach. The PVA Office cannot accept payment for taxes. All county property taxes are paid to the Franklin County Sheriff’s Office. 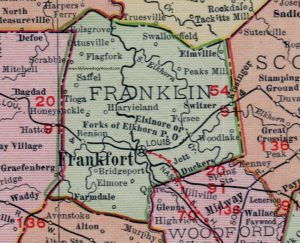 All city bills are paid to the City of Frankfort. The tax rate consists of a state tax rate, a county tax rate, a city tax rate (if applicable), a library tax rate, a health tax rate, an extension office rate, a fire district rate and a school district rate. All automobiles, trucks, boats, boat trailers, motorcycles, aircraft, and recreational vehicles must be assessed as of January 1 of each year. Motor vehicles are generally taxed in the county of registration. If you have assessment questions regarding motor vehicles or boats, please contact the PVA office at 502-875-8780. The PVA may be able to lower the value of your vehicle if you have excessive mileage or damage. If you have assessment questions regarding your motor vehicle assessment, please contact the PVA office at 502-875-8780. * A copy of the front and back of the KY title indicating you transferred the vehicle. If you moved out of state, you may provide the PVA with a copy of your new title, or a copy of your registration.